Gwendolyn Strong Foundation : Blog : Chase Celebration Reception - You're Invited! 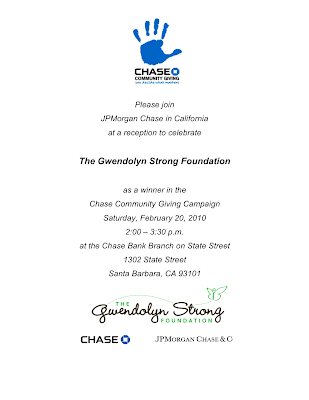 We are so, so, so excited to announce that this Saturday, February 20, JP Morgan Chase is hosting a celebratory Chase Community Giving reception at one of their Santa Barbara, California Chase branches for the Gwendolyn Strong Foundation and we would love for our wonderful supporters to attend. There will be light refreshments, short speeches, and lots of celebrating. If you are in the Santa Barbara area, stop by for a toast! And for all the incredible SMA families around the world who made this possible, we are taking you with us in spirit...this miraculous win was for all of us, all of our children, all of our angels...all of us fighting to end this cruel disease.